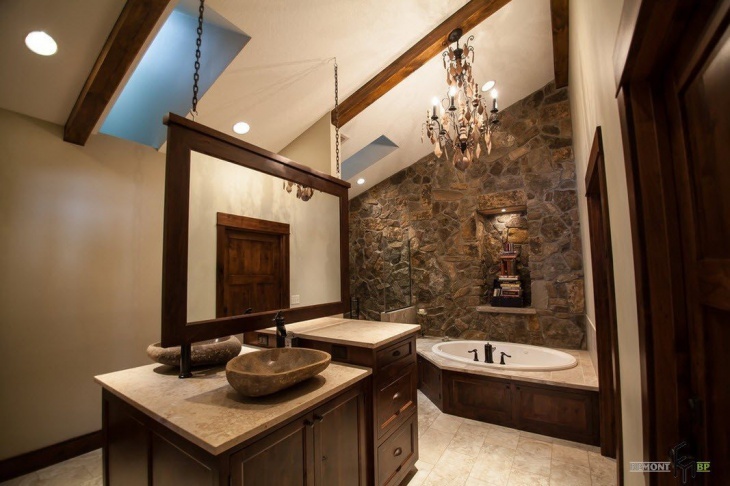 Looking for a bathroom design that looks rustic and enchanting? You would probably love the idea of stone wall design theme. 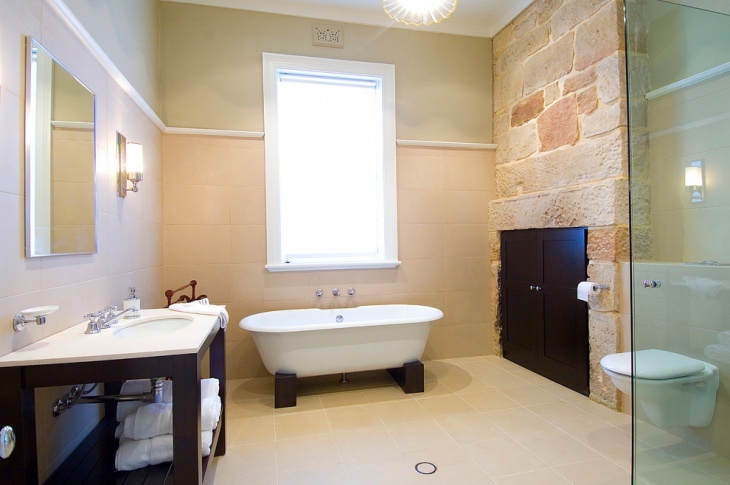 Stone walls for bathroom are nothing new and have been incorporated into exotic architecture for ages now. However, it has been in the last decade that we have arrived at more polished and stylish versions. Simplicity and warmth is the main theme of the décor. Here are our top picks from across the globe. 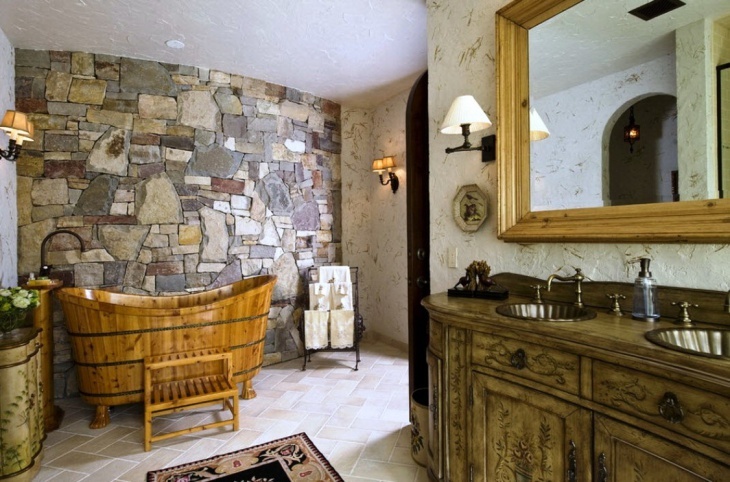 Stone wall theme actually takes the form of rugged looking tiling by you Jacuzzi! Complimenting the rustic wall color are wooden cabinetry and ceiling beams that complete the look of the theme. Add a plant pot in the décor and this would be a surreal environment to be in. Stone walls take more prominence here with only the ceiling and the floor being laid out in the conventional tiling. 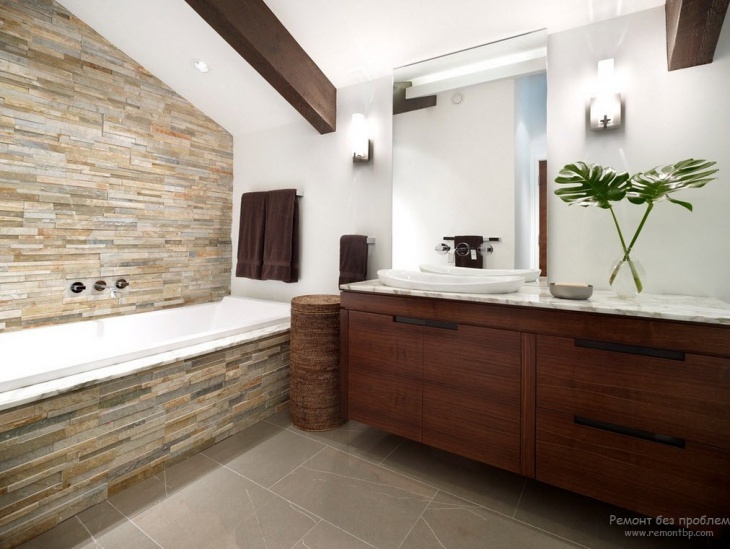 The ruggedness is just in the looks but the décor is actually quite polished, making the bathroom completely safe. An earth themed cabinetry and a flower vase will add to the exotic romance of the space. The bathtub takes the center place in this bathroom theme. 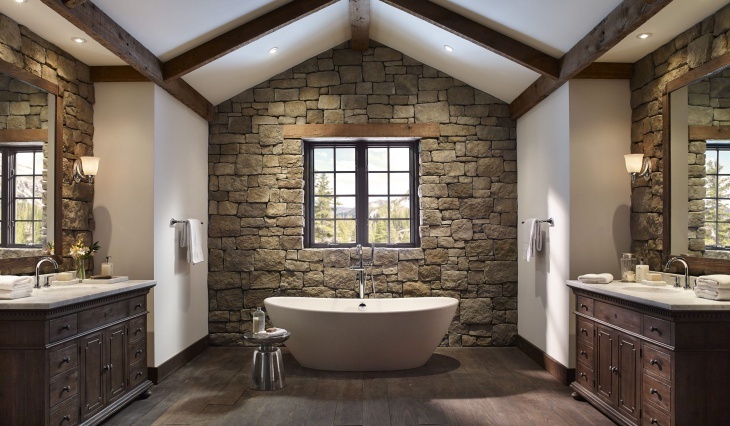 The rustic ambience is perfectly created by rugged stone walls and warm lighting to make it look even cozier. Wooden beams and cabinetry are an essential part of the complete décor. Stone walls take a more polished form in this décor. 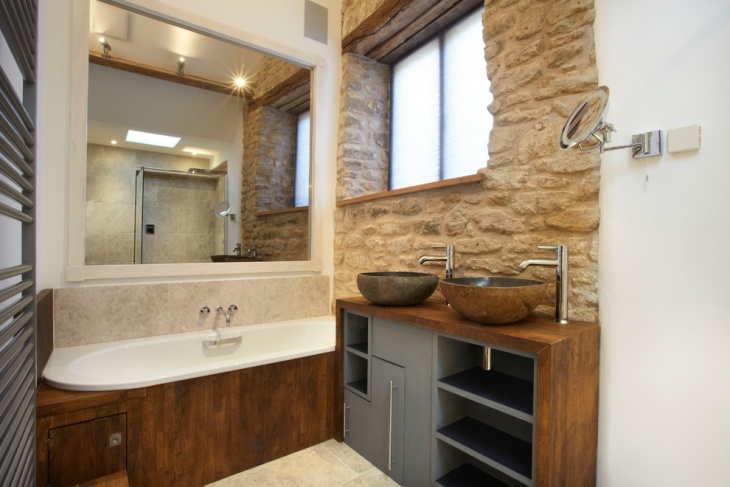 Polished and carefully inlaid, this stone wall forms a singular wall on the face of the basin. The rest of the room features white tiles and employs unique lighting fixtures to bring out the mood. The stone theme follows itself to even the sink bowls. A stone mosaic work all around, everything from the door to the ceiling beam follow a rustic theme. Privacy and luxury cannot be more alluring! 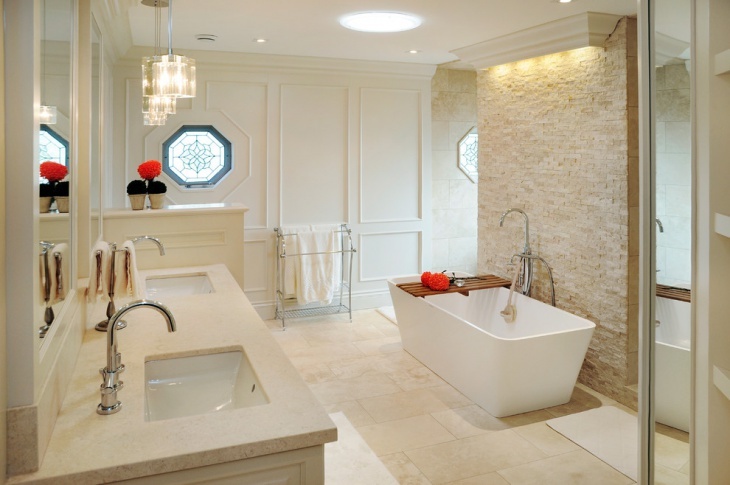 For bigger bathroom schemes, stone work can be inlaid as the bath walls, sink and any opportunity of tiling. 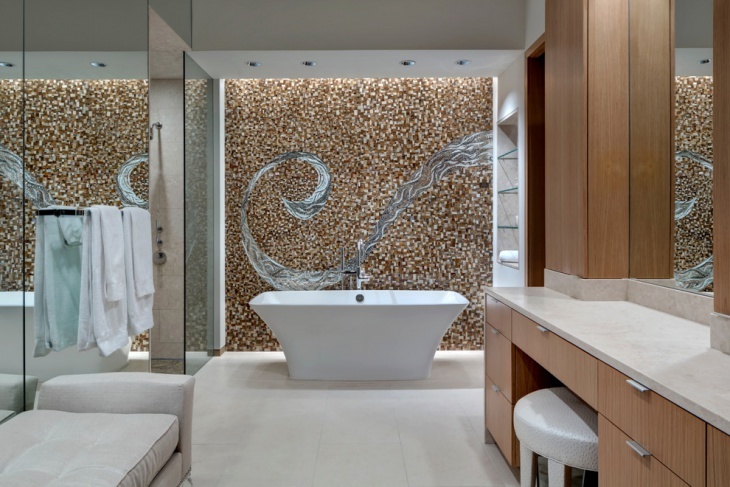 Lit ambient, this bathroom immediately portrays a warm appeal that cannot be missed. 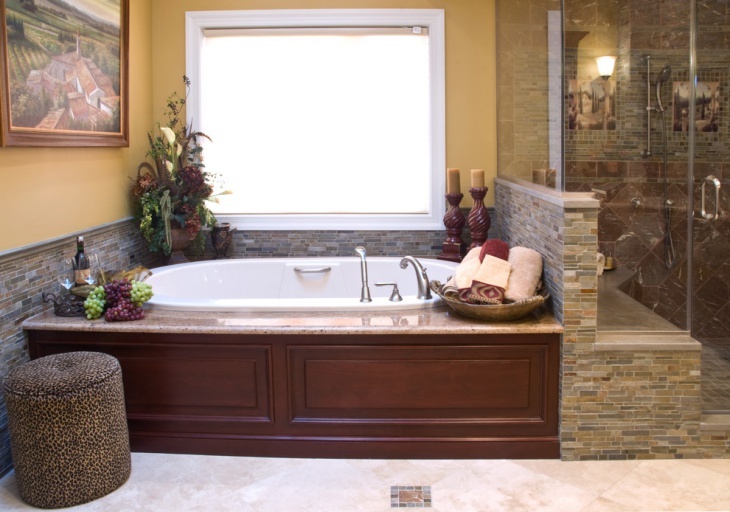 Glass and stone can come together to create an exotic bathroom space. Wooden handles, timber work on doors, cabinets and ceiling and chandelier type lights complete the appeal of this décor scheme. Wall mosaic can be made quite interesting with the right choice of veneer. Wooden cabinets, storage and tubs will rightly compliment this design scheme. A cozy and private environment can be created using warm lights and candles. 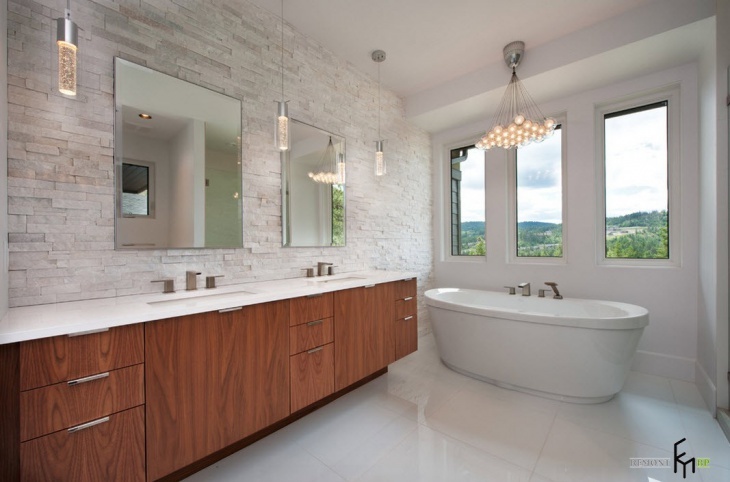 White stonework looks gorgeous when combined with modern day elements like glass and metal. The overall white scheme can be well contrasted with a couple of contrasting pieces of metal like the rustic bath tub or a part of the cabinetry. Either ways, it looks phenomenal. 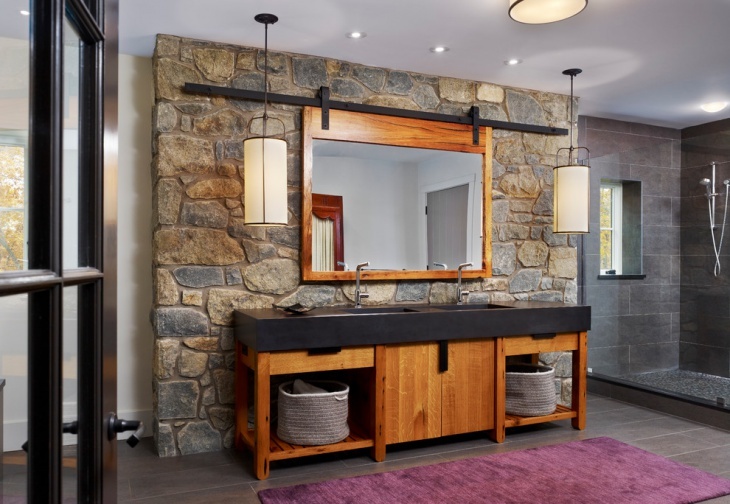 Grey stone wall in modern bathroom can be well complimented with the right kind of lighting installations. Glass and other reflective surfaces on the floor and ceiling will create an ambient mood using the diffused beams. Overall it will be a space that perfectly balances the need for modern and the quest for the traditional. 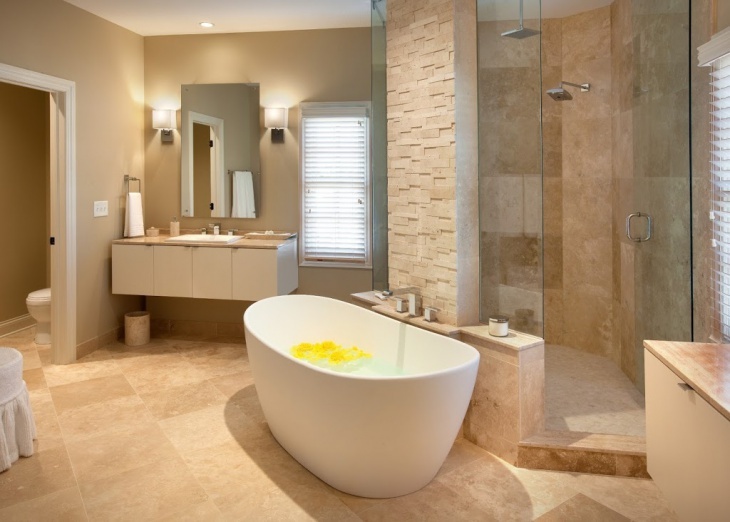 Bathrooms are supposed to be one of the most private spaces in the home. The design should thus follow an ambient mood and themes that reflect romance, warmth and style. If you have liked our collection, we would like to hear a feedback. 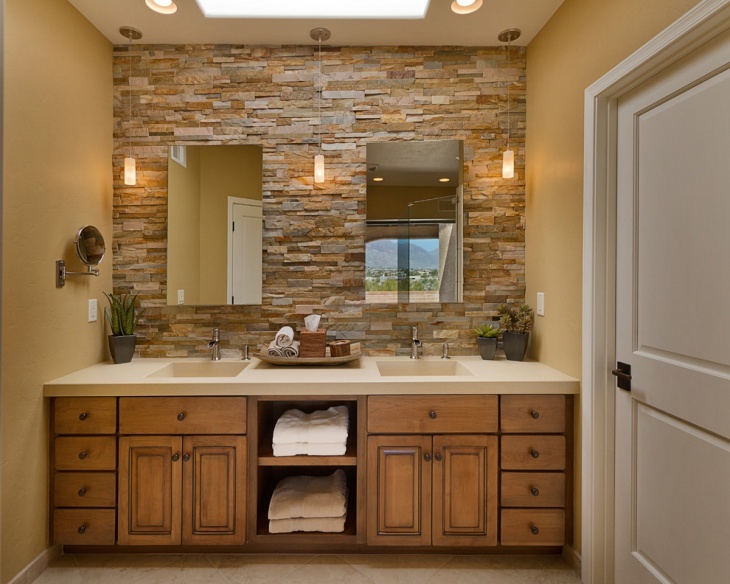 We would also like to take a peek into your ideas for stone wall bathrooms.